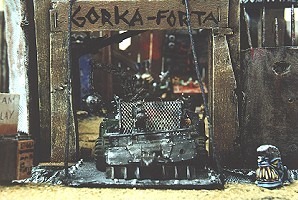 If you’ve ever even flicked through the pages of Da Uvver Book you’ll know that having a fort is one of the best things about Gorkamorka. The original game came with a cardboard one but that’s really more of a stop-gap until the glue has dried on the one on the workbench, ain’t it? It was also republished in Gubbinz bundled with an article from White Dwarf 215 entitled “Mektown Madness: Markus’ Fort”. We’re working on getting hold of that article separately (the CJ article is reproduced identically in Gubbinz). This entry was posted on Thursday, April 11th, 2013 at 02:49	and is filed under Terrain. You can follow any responses to this entry through the RSS 2.0 feed. You can leave a response, or trackback from your own site.